1) (co. Brecknock, Wales, which estate was acquired by Bernard de Newmarch, temp. William I.). Gu. five fusils conjoined in fesse or. 2) (Baron Newmarch; Adam de Newmarch joined the Baronial Standard temp. Henry III., and was summoned to Parliament by the rebellious lords after the battle of Lewes, but the writ was not renewed to any of his descendants). Gu. five lozenges conjoined in fess or. 3) (Sir Thomas de Newmarch, Roll of Knights in cos. Derby and Notts, temp. Edward I.). Ar. a fess indented gu. 4) (Sir John de Newmarch, Roll of Knights in cos. Derby and Notts, temp. Edward I.). Same Arms, tinctures reversed. 5) (co. Nottingham). Ar. five fusils conjoined in fesse gu. on a border sa. eight crosses crosslet of the field. 6) (co. York). Gu. a fess indented ar. Crest—A dove, holding in the beak an olive branch all ppr. 7) (Newcastle-on-Tyne). Gu. on a fess or, five fusils sa. Crest—A demi griffin ppr. 8) Gu. a fesse dancettee ar. Crest—On the sea an anchor in pale ensigned with a dove and olive branch all ppr. 9) Or, five fusils in fesse gu. on each an escallop of the field. 10) Ar. a fess fusily gu. on the centre one an escallop or. 11) Gu. five fusils in bend ar. 12) Ar. five fusils in fess gu. on each an escallop or. 13) Ar. three chevronels sa. 14) Ar. a fess fusily gu. on a border sa. eight martlets of the first. 15) Sa. on an inescutcheon ar. a fesse lozengy gu. 16) (co. Derby). Gu. five fusils in fess engr. or. 17) (co. Nottingham). Ar. four (another, five) fusils in fess gu. Crest—A tower, triple-towered ppr. This is a locational name meaning “of Newmarch”, which refers to land that was lost to marshes. It derives from the old English word niwe. It is an anglicized version of the German surname Neumark. Other spellings include Newmarche, Newmark, Neumarche, Neumarch, Nefmarch, Neufmarche, and Newmarsh. The Hundred Rolls of 1273 AD, a census of Wales and England, known in Latin as Rotuli Hundredorum, documents one Adam de Neumarche in county Lincoln. A one John Newmarch was buried in 1591 at St. James Clerkenwell. Marriages involving this surname include Mattihias Newmarch to Mary Rouse in 1785 at St. George’s Hanover Square. One early person bearing this name was a companion of William the Conqueror (1066 AD) named Bernard de Novo Mercato (aka Bernard Newmarch), a Norman nobleman, who accompanied him and settled near Brecknock, and he founded a priory there, which later became a cell to Battel Abbey. 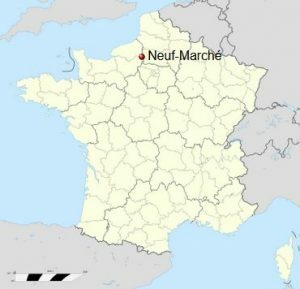 He came from a location in Normandy, France known as Neuf-Marche, close to Neufchatel, which was formerly known as Novus Mercatus, meaning “the new market”. He was succeeded by Baron Newmarch who was summoned to Parliament. Bernard lived from 1050-1125 AD and was known as “the first of the original conquerors of Wales”. He rose to power in the Welsh Marches. He had a daughter named Sibyl de Neufmarche, the Countes of Hereford. A Margery Newmarch or de Newmarch, later surnamed Foliot, was born in 1252 AD at Womersley in West Riding, Yorkshire. She was the daughter of Adam Newmarch. She married Jordan Foliot and had three children before she passed away in 1330 AD: Walter, Joan, Richard. John Newmarch of Ipswich recorded in 1638 at Rowley. He married Martha, the daughter of Zaccheus Gould and had the following issue with her: John, Thomas, Zaccheus, Martha, Phebe, Pennywell, and Sarah. The family sometimes later spelled the surname as Newmarsh. The son named Zaccheus was born in 1651 and he married Frances (last name unknown) and before dying in 1731, had one child named Hannah (Newmarch Campernell). The son John was born in 1649 in Massachusetts Bay Colony and married Johanna (Burnham) James. A Thomas Newmarch was born in 1780 and married Laura Rosetta Phelps in Maine and had the following children with her: Amelia, Clarinda, Rocetta, Samuel, Thomas, Harriet, and Mary Ann Celia. Another early settler was William Newmarch, who arrived in Maryland in 1679 AD. The family motto is “I shall not boast”. Famous people bearing this surname include: 1) Oliver Newmarch (1835-1920) who was a British Army officer in India, 2) Rosa Harriet Newmarch (1857-1940) who was an English writer, and 3) William Newmarch (1820-1882) who was an English economist and banker who published a Guide to York.